It’s the End of the World as We Know It . . . | "Granny Beads and Grocery Store Feet"
It’s the End of the World as We Know It . . .
And I feel fine. My apologies to Michael Stipe and the rest of R.E.M. Harold Camping, current Doomsday prophet. So by now you’ve probably heard that the world is going to end this coming Saturday. According to 89 year old self-taught theologian, Harold Camping, the numbers all add up and it’s all over but the shoutin’ as they used to say. From his readings of the Bible, Mr. Camping has worked out the exact day and hour of The Rapture, the supernatural event when Jesus is returning to gather His faithful home. The prediction has spread like wildfire among fringe Christian groups and folks all around the world are, in the words of the old gospel song, “gettin’ ready to leave this world.” A group of atheistic animal lovers has even started a company to address the needs of the beloved pets who will be “left behind” as their owners are Raptured. As for me, I plan on going to our church’s Saturday night service like Budge and I usually do. Sunday, we’ve got a full day of doing nothing planned, pretty much like always. I’m not really worried about The Rapture taking place this weekend for one simple reason — when Jesus Christ Himself was on the earth teaching His followers, He specifically told them that He didn’t even know when He would return. The only Being in the universe who is privy to that date and time is God the Father and while Mr. Camping IS as old and white headed as most people seem to figure God is, he’s not God. Ergo, he doesn’t know squat. He’s just another member of the lunatic fringe like that idiot Fred Phelps and his congregation of inbreeders out in Kansas. Just another person heading up a group of like (and feeble) minded people carrying signs and giving non-believers the world over just another reason to mock Jesus and Christianity. At least the members of Heaven’s Gate had the tact and decency to kill themselves rather than spreading their kooky comet-following message all over the internet. 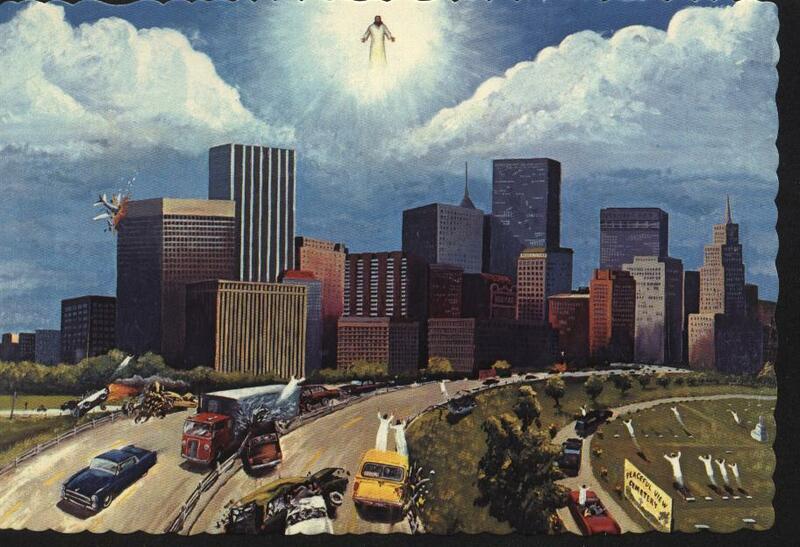 My Aunt Betty had this painting called "The Rapture in Dallas" hanging in her living room. It scared the crap out of me when I was a kid. Don’t misunderstand me though. I was raised in a fully Rapture believing and Rapture ready home and church. To be completely honest with y’all, I never figured I’d see forty years old because I believed whole-heartedly that my family and I — based on the steeply declining condition of the world — would be gone in the Rapture well before then. Obviously that hasn’t happened . . . yet. That’s right — yet. I don’t discount the possibility that the Rapture could take place, but it’s not one of the major doctrines of Scripture, it’s very divisive to the Church, and it’s just not a mountain I’m prepared to die on. All that said, however, growing up steeped in the belief of an imminent Rapture did lead to one of the most “terrifying-then-and-hysterically-funny-now” events of my life. I was a junior in high school and enjoying my best, and last, season as a starter on the school wrestling team. I got home from practice one Tuesday afternoon and the house was empty, which was odd because Mama should have been home. I sat down to a bowl of ice cream and waited. After half an hour, I started to get concerned. One very important thing for y’all to know is this was 1987 — before answering machines were commonplace and way before cell phones were ubiquitous, if they even existed. This series is pretty close to the beliefs I was taught growing up. If you've read any of it, you know why I was freaking out. I called Mama’s work, no answer. I called Papa John to see if Mama was over there. No answer. I called Granny and Papa Wham. No answer. Finally, I called out to Aunt Mary’s and I KNEW she was home because her car was in the yard when I came by and she’d be getting supper cooked for Uncle Carroll. No. Answer. I went into a blind panic and started calling around and everywhere I called either no one answered or I got a busy signal. Now at this point, most rational people would have figured something totally explainable was at work. Well, I was reasonable and I came up with the only logical solution I could think of — The Rapture had come and Jesus took Mama and the rest of my family and I had been left behind! When that realization hit me, I almost upchucked my bowl of ice cream. If you’ve ever studied what some churches teach on the Great Tribulation period that will follow the Rapture, you’ll know what had me in a twist. Seven years of Hell on earth ruled by the Antichrist — Satan’s agent. Anyone who converted to Christianity during that time would be hunted down and publicly executed. Plagues of demons in the form of scorpions. It’s not a pretty picture and that’s exactly what I thought was waiting on me because everyone I knew was a Christian and loved WAS GONE. I was alone and left behind. When Mama got home thirty minutes later and came into my room to ask my help in getting the groceries she’d stopped off after work to pick up without telling me, she found me sitting in the middle of my bedroom floor rocking back and forth nearly in shock. When I realized it really was her and not a vision of some sort, I nearly broke her back and neck in a bear hug. To this day, I have never felt more relief about anything than I felt at that moment. Why couldn’t I get in touch with anyone? A car had taken down a telephone pole nearby and service was interrupted. Calls went through like normal, but they wouldn’t connect anywhere. So be careful what you scoff at! Love you all and keep those feet clean. Pingback: TEOTWAWKI . . . Redux | "Granny Beads and Grocery Store Feet"